Please choose a category from the sub-menu on the left. Fig. 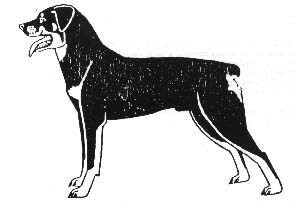 1: Shows a dog that lies at the upper limit of his substance. Excessive weight of the bones and the associated heavy bundles of muscles with fat are a burden which not only limits mobility and endurance but also the internal organs, particularly the heart and lungs can hardly cater for this mass in necessary way. Fig. 2: Against the dog that is too heavy we have the type that is too light. Because of the insufficient body weight this is often lacking in assertiveness. The necessary depth of chest and muscle power are often absent. Such dogs are mostly temperamental and uncontrolled. Fig. 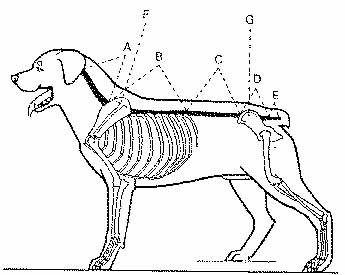 3: For the Rottweiler the golden mean should be aimed at this. 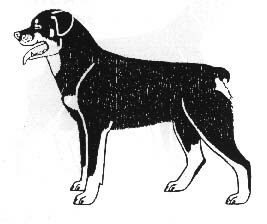 This dog corresponds most closely to the requirements of the standard. In this desirable working type there is a good relationship between the weight and the strength of the bones. The appearance conveys an impression of proportion, size, substance and strength. A powerful deep chest, not flat-ribbed, a well arched thorax provides a good base for the front limbs and sufficient room for the internal organs to carry out their vital function. For persistent running at the trot the build of a trotter is needed. Here the relationship of power and substance is significant for the desired bouncing and striding motion. The most important thing is a solid structural skeleton which gives support to the body. In the rear part the structures with the backbone, consisting of three ossified back vertebrae, is firmly linked with the pelvic girdle and is supported by the hind extremities. While the base (lumbar vertebrae, backbone, pelvis) represents an unshakeable combination, the structure is only supported by muscles between the two shoulder blades. Fig. 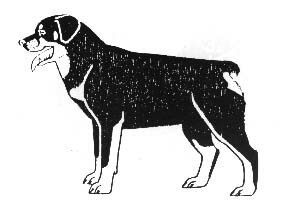 5: Shows the trotting Rottweiler at the moment when the pair of limbs 2 and 4 have stopped pressing down and are about to rise. The rise and descent of the limits do not take place quite simultaneously, the direction of the two corresponding actions however occurs more or less in parallel and works either against or from the skeleton. The direction is determined by the foot and its undersurface on the one hand and by the support point of the skeleton on the other hand. Fig. 6: The forces are thought of as being in the medium plane. No account is taken of the rotary effect. The resultant forces of H and I yield the thrust force. The resultant I of the two lifting forces and the resultant H of the two pressing forces interseat approximately in the middle of the skeleton. The effect of I and H yield and almost horizontal thrust force. It will be seen that the dynamic effect operates as in the case of a bridge. As a trotter the Rottweiler is required to achieve a maximum of endurance through the economical expenditure of forces. The Intersection G is the turning point of the action lines of the movements phase 1 and 4 at the moment when the lateral support is at its weakest. 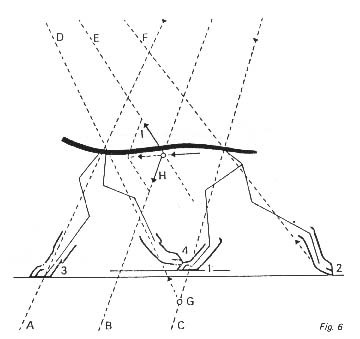 If this turning point rises above ground level, the dog must proceed from the trot to the gallop, or else run at a constrained and tiring trot. 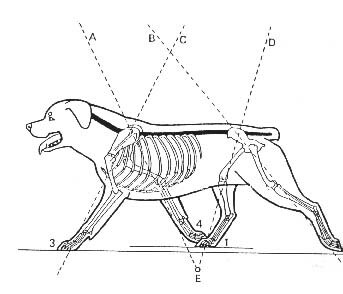 Observations show that square, well-angled dogs do not run at as demanding a trot as those of more extended build. The opening and closing of the joints proceed according to the laws of the minimum application of force. For that reason the dog that is too long cannot, in continuous trotting, bring his legs sufficiently under the trunk in relation to the length of his body. The intersection G goes deeper under the ground. The result is that the dog presses down more than it bounces, and expends a great deal of force. Endurance is limited. The centrifugal forces caused by movement will be saved according to the exercise of running energy. The best result follows when the intersection G, as represented in Fig. 5, lies close before the surface. This takes place when the ratio of length to height corresponds to 10:8.5 to 10:9. This can only function, however, when the whole system is firmly enclosed within itself with good, strong musculation and precisely working joints. A machine with broken bearings and connecting rods will not run any more. It is clear why sound hips must be demanded. The turn towards more mass than class, ever bigger and heavier, finds its limits when health, character, mobility and performance are restricted.